Cream Cheese Wontons with PINEAPPLE & COCONUT! 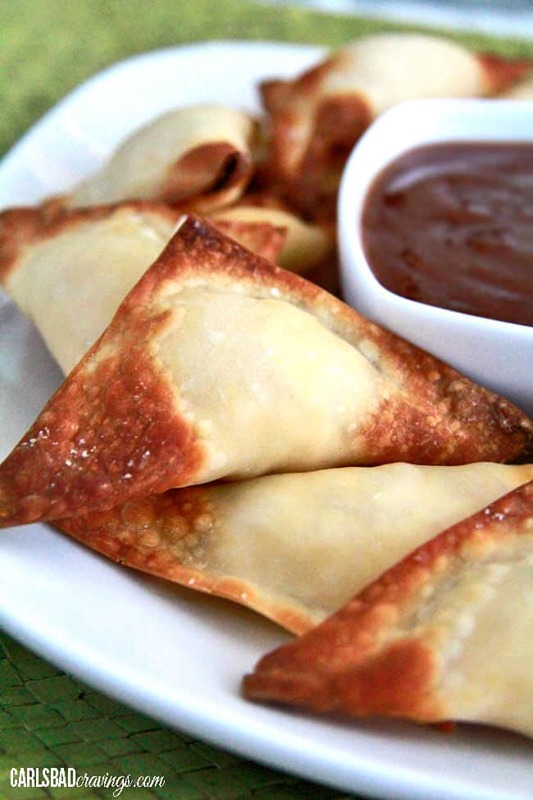 Baked or Fried Cream Cheese Wontons that are restaurant delicious! Enjoy gourmet-tasting Cream Cheese Wontons in the comfort of your own home! These crispy cream cheese rangoons are crunchy on the outside giving way to warm, oozing, melted cream cheese inside. The cream cheese filling is mixed with pineapple, coconut, green onions and ginger AKA your new addiction. These easy cream cheese rangoons taste straight out of a restaurant – or dare I say even better?! I’ve included step by step photos, easy to follow instructions, and how to freeze cream cheese wontons for an easy snack or appetizer any night of the week! There are a few things my husband makes really well: pasta, and pasta, steak, pigs in a blanket, and cream cheese wontons. Patrick would always bring his famous wontons to New Year’s Eve parties or any other get togethers and they would fly off the plate!Aside from Patrick’s cream cheese wontons, I used to devour them at my local Pick Up Stix or Panda Express whenever I had the chance. I could never get enough of the crispy wonton outside giving way to warm, oozing, melted cream cheese inside. Seriously, does it get any better? !Yes it does! Because now you can make this cream cheese wonton recipe in the comfort of your own home AND you have the option to bake wontons instead of fry them. 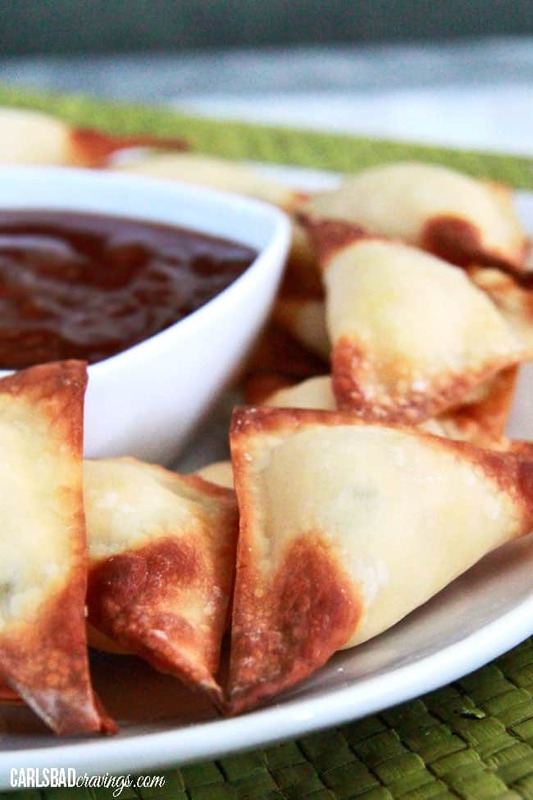 So, If you have never made cream cheese rangoons before, you are in for a treat. Not only are they one of the best appetizers you will ever sink your teeth into, they are SO easy! Are wontons and Rangoons the same thing? The answer is, yes! Whether you’ve ordered cream cheese rangoons or cream cheese wontons at your favorite restaurant – they are identical, just with a different name. I just call them delicious.Rangoon is a actually a Burmese city. Wontons filled with cream cheese and imitation crab are named after the city – crab rangoons, whereas wontons just filled with cream cheese are often referred to as wontons – but they are used interchangeably.Wontons when not referred to as “cream cheese wontons” refer to dumplings like in my Wonton Soup. They use the same wrapper but have a savory, meaty filling. So now you have multiple reasons to buy wonton wrappers! 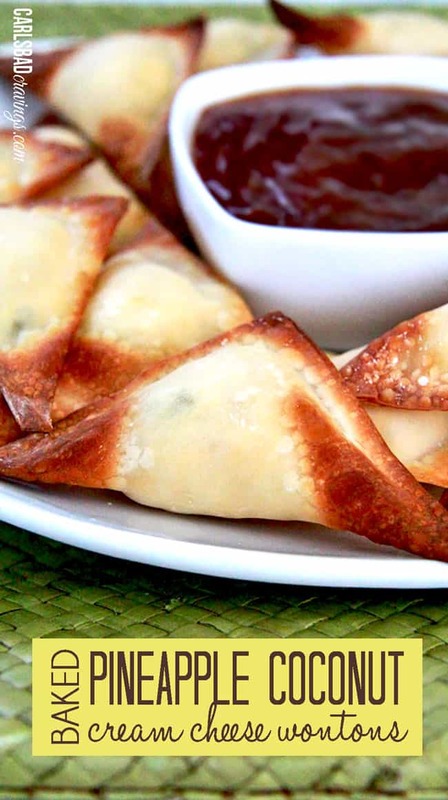 Where did cream cheese wontons originate? The wonton wrapper comes from the Canton region of china. The word “wonton” is Cantonese for “swallowing clouds” – swallowing clouds of cream cheese and pineapple – pick me!Despite the origin of the wonton wrapper, cream cheese wontons do not come from China. Rather, a Polynesian restaurant in San Francisco, named Trader Vic’s, starting serving crab rangoons in 1956.It is loosely based off of a traditional Burmese recipe but largely Americanized because dairy was not widely available in that area of Asia at the time – another successful marriage of American and Chinese cuisines!I added additional Polynesian flair to the traditional cream cheese wontons with pineapple, coconut, ginger, etc. and voila! we get the tasty tropical dish of swallowing clouds with pineapples. What are cream cheese wontons made of? Where do I find WONTON WRAPPERS? 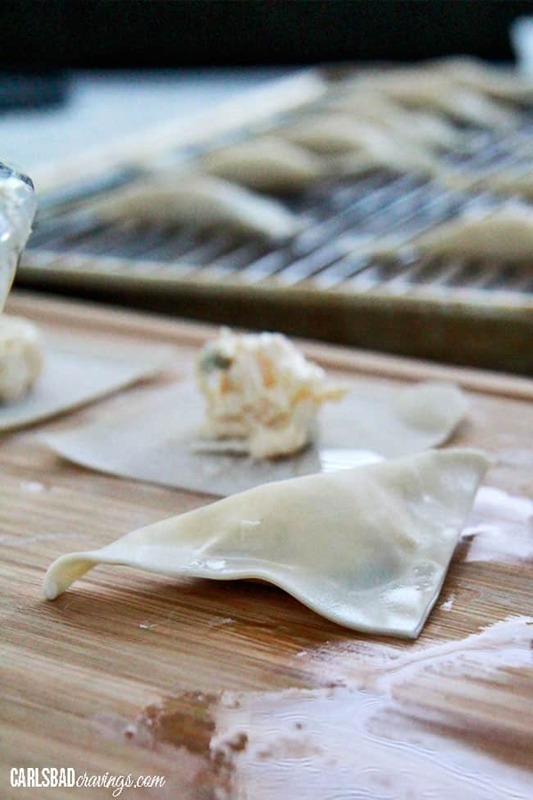 You can’t make cream cheese wontons without wonton wrappers! But you’re in luck, wonton wrappers are easy to find at any grocery store, and definitely at specialty Asian markets.At my grocery store(s), the wonton wrappers are located near the produce, at the end of the aisle in the refrigerated section. 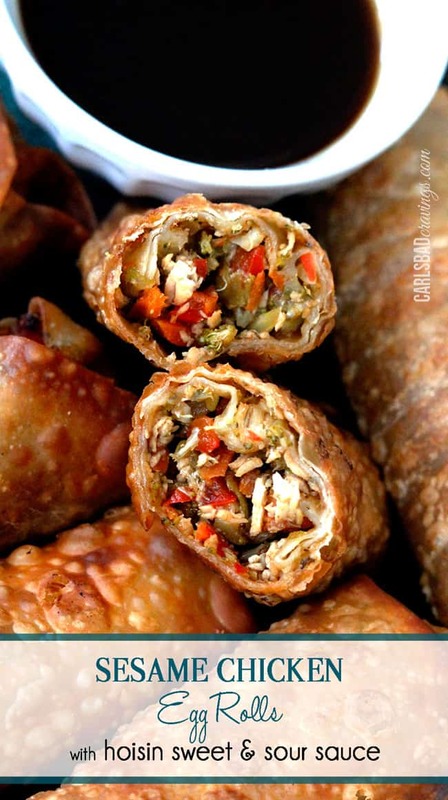 You need 36 wonton wrappers for this rangoon recipe, so make sure you check the wrapper count. Depending on the brand of wontons wrappers you purchase, you may need one or two packages. Yes! 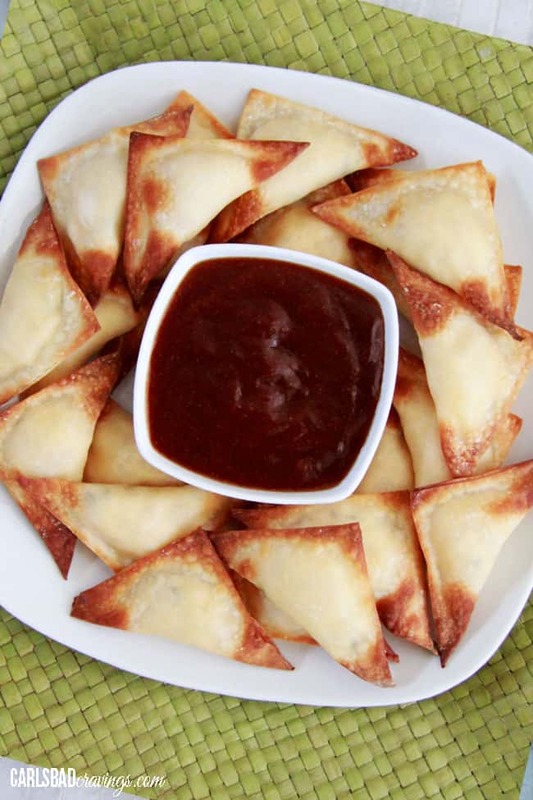 You can make cream cheese rangoons with full-fat cream cheese or low fat cream cheese. Full fat cream cheese obviously has more flavor and melts better, but cream cheese wontons made with low-fat cream cheese will still be tasty. Mix up your wonton filling ingredients. Brush the edges with water, fold into a triangle and press the edges together. Brush wontons with oil and bake or fry. How easy is that?! I love that there is no cooking meat or chopping veggies involved in making these crispy on the outside, pineapple, coconut creamy inside rangoons! Working on a flat, dry surface, lay out 4-6 wonton wrappers. Keep remaining wontons covered with plastic wrap or in a large freezer bag. You can work with more or less wontons at a time depending on your comfort, speed and skill level. The key is to not let the wrappers dry out by sitting out too long while your working on other wontons. Place a heaping 1 teaspoon wonton filling in the center of each wonton wrapper. Don’t fill your wontons with too much filling or they won’t stick together. Working with one wonton at a time, wet your finger and brush the edges of the wonton wrapper with water. 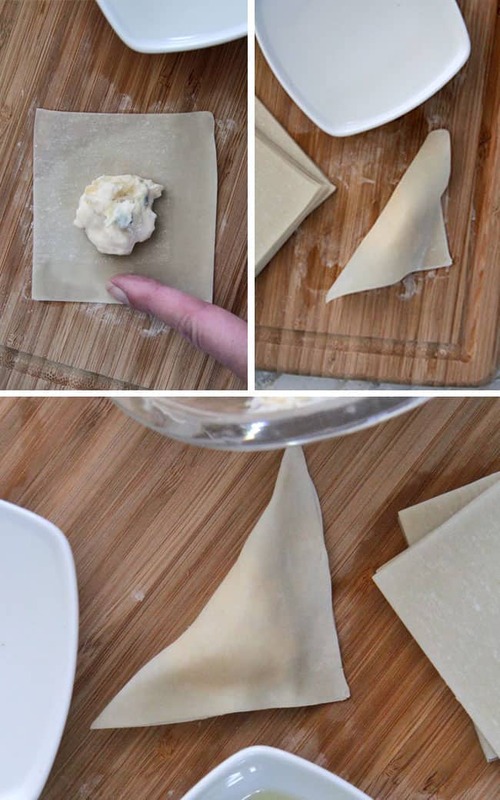 Fold the cream cheese wonton into a triangle by bringing 2 opposite corners of the wonton together to enclose the filling. Pinch the edges of the wrapper together to firmly a seal, pressing out any air. Place finished wontons on parchment paper and cover with a damp paper towel or damp towel so they don’t stick and don’t dry out. Don’t over stuff: if the cream cheese rangoons are stuffed with too much filling, they will spring apart. Stick to one teaspoon of filling per wonton. Don’t dry out: wonton wrappers can easily dry out which will make them brittle and break or tear easily. To prevent this, keep any wrappers you are not working with under a damp cloth or in a sealed bag. Only remove them when you are ready to use them. 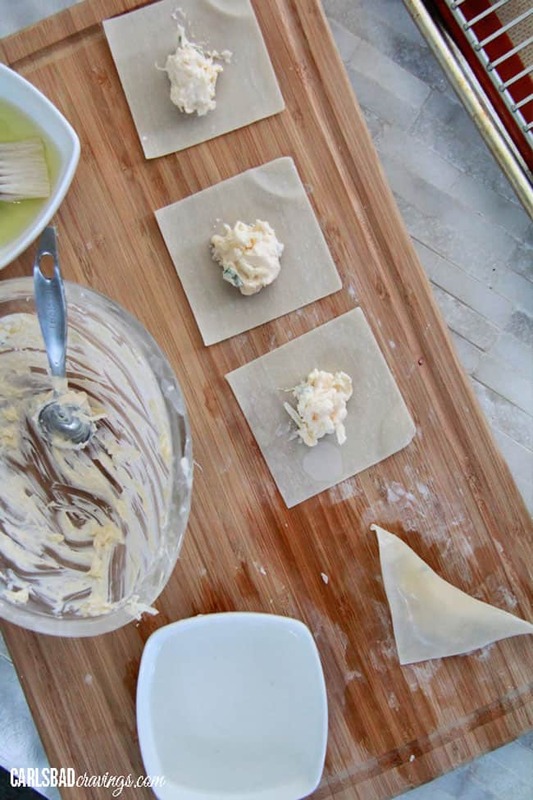 As soon as you have filled your wonton wrappers, place them on parchment paper under a damp cloth. Use parchment: placing the finished wontons on parchment paper is important so they don’t stick, otherwise, they can stick to a cutting board/other surface and tear. Limit water: don’t use too much water to seal the wontons otherwise the wontons become soggy and the edges will not stick together. Only lightly dampen the edges. Clean work surface: before you start a new batch of wontons, wipe your working surface so it is dry otherwise your wonton wrappers will become soggy and tear. 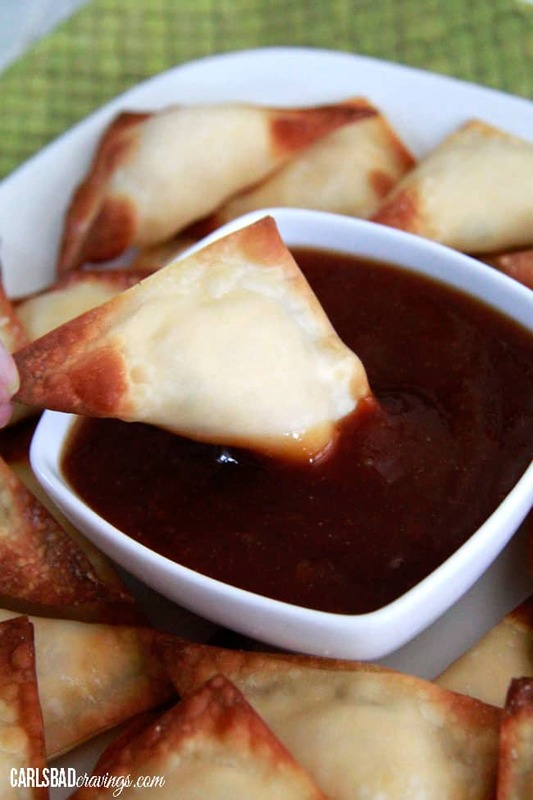 You can bake or fry your cream cheese wontons and they will both be delicious. To bake, simply line wontons on a lightly greased baking rack and spray with cooking spray. Bake 8-12 minutes or until corners are browned and crispy. To fry cream cheese wontons, heat about 4 inches deep oil in a heavy bottomed pot to 350 degrees F. Fry about 5-6 wontons at a time, whatever will fit comfortably so they can move around and aren’t touching. Fry until golden, about 3-5 minutes. Transfer fried wontons to a paper towel lined plate and repeat until all the wontons are cooked. Can Cream Cheese wontons be refrigerated? Cooked cream cheese wontons can be refrigerated but I do not recommend refrigerating uncooked wontons. Wonton wrappers dry out very quickly and will become brittle when refrigerated if they have not been cooked, which will cause them to tear and leak when baked or fried.To store cooked cream cheese wontons, line them in a single layer on a paper towel lined plate/platter and cover with foil.To reheat, place them on a baking sheet and crisp them up in the oven at 300 degrees for 5-10 minutes. CAN I FREEZE UNCOOKED WONTONS? Place assembled, uncooked wontons on a parchment-lined baking sheet/plate (whatever will fit in your freezer) without touching. Loosely cover with plastic wrap. Freeze wontons until solid, about 1 hour. Transfer wontons to a freezer bag. Cook wontons directly from frozen by either baking or frying, adding a couple extra minutes to cooking time. CAN I FREEZE COOKED CREAM CHEESE WONTONS? Yes, these cream cheese wontons freeze beautifully! Freezing the wontons creates a fabulous easy- snack/appetizer option for all those busy parties or nights. Place assembled, wontons on a parchment-lined baking sheet/plate (whatever will fit in your freezer) without touching. Freeze wontons until solid, about 1 hour. Flash freezing them allows them to be stored together without sticking to each other. 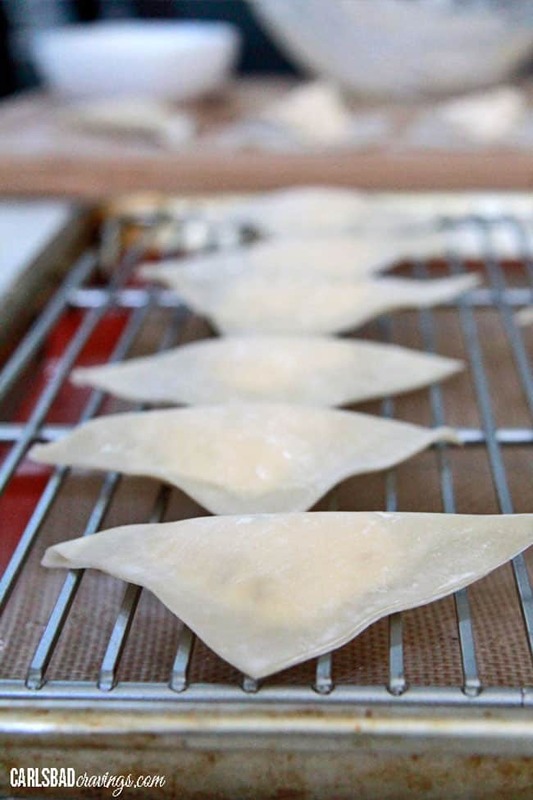 Transfer wontons to a freezer bag and squeeze out any excess air. To reheat, place wontons on a baking sheet and bake at 300 degrees for 8-10 minutes. After you simmer your sweet and sour sauce, you can taste and customize it so it’s YOUR favorite sweet and sour sauce. Add more sugar for sweeter, more vinegar for more tang and sriracha for a kick. 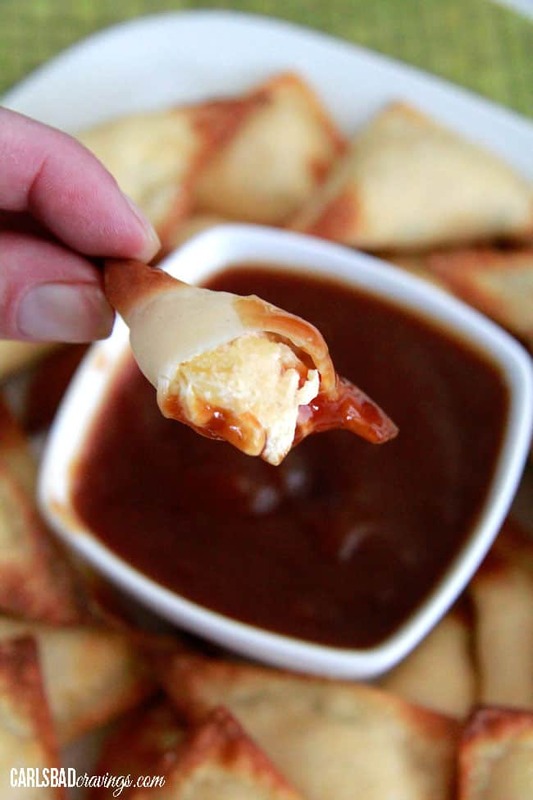 If you don’t have the ingredients for sweet and sour sauce, cream cheese rangoons are also delicious with Asian Sweet Chili Sauce! Mix in some imitation crab to create cream cheese crab rangoons! mix cream cheese with garlic powder, onion powder, herbs and ANY cheese such as cheddar, pepper jack, Gouda, etc. Mix cream cheese with artichokes and spinach for artichoke spinach dip wontons! Before you leave to make this scrumptious and versatile cream cheese wonton recipe, did you know there is a Hollywood film make in 2001 called Miss Wonton? I mean, if they can make a movie about it, its good enough to eat, right? !I wont be in Hollywood anytime soon, but I can promise you. Patrick and I are going to experiment with some of these great ingredient substitutions for our favorite Wontons! What will you try next?! Looking for more Asian appetizer recipes? Want to try this Cream Cheese Wonton Recipe? Pin it to your ASIAN or APPETIZER Board to save for later! Enjoy gourmet-tasting Cream Cheese Wontons in the comfort of your own home! These crispy cream cheese rangoons are crunchy on the outside giving way to warm, oozing, melted cream cheese inside! The cream cheese filling is mixed with pineapple, coconut, green onions and ginger AKA your new addiction. These easy cream cheese rangoons taste straight out of a restaurant - or dare I say even better?! I've included step by step photos, easy to follow instructions, and how to freeze cream cheese wontons for an easy snack or appetizer any night of the week! Add 1/2 cup water to a small bowl. In a large bowl, whisk together wonton filling ingredients until well combined. Place a heaping 1 teaspoon wonton filling in the center of each wonton wrapper. Wet your finger and brush along the edges of the wonton wrapper, then fold into a triangle, pressing edges together to seal well. Repeat for the rest of the wontons. Place finished wontons on a baking rack ontop of a baking sheet and lightly brush both sides of each wonton with olive oil or coconut oil. Bake for 8-12 minutes or until corners are browned and crispy. To make the Pineapple Sweet and Sour Sauce, whisk together ketchup, vinegar, sugar and garlic in a medium saucepan. Pour pineapple juice into 1/2 cup measuring cup then add water to equal full 1/2 cup. Whisk in cornstarch to the pineapple juice/water then add to saucepan and stir until well combined. Bring ingredients to a boil and simmer until thick – 1-2 minutes. Taste and add additional vinegar for more tang/sour or sugar for sweetness according to your preference. You can also add sriracha for a little heat. In love the twist with pineapple! Sounds and looks delicious! Thanks so much Spencer! The pineapple adds a nice twist! I am thinking Christmas Eve?! What perfect sweet little bites, and I love that you baked them. Thanks so much Janette! They are so tasty baked too! Love this and those flavors. Really like that you baked them! Thanks Mary Ellen! They are so tasty baked, you will love them! OMG … I want these now! They really look amazing and what a great flavor combo! You’ve got that bit of sweet heat going on here that I love! I can’t wait to try these! They look fantastic! Thanks Sheena, I think you will love them! There you go knocking it outta the park again! This looks AWESOME! Pinning! Thanks so much Sophia! Your comments always make me feel so good :)! P.S. THEY WERE FAB!!! It was brilliant to bake them with the coconut oil. BEST EVER! I will take a whole plateful, please! I love that these are baked! I think they should be fine frozen but if you have time, I would suggest making them ahead of time up to the baking point and then instead of freezing them, refrigerate them. That way, all you have to do is bake them when its party time! Are these ok to serve at room temp, or do they only work when warm? Hi AJ! As with most foods, fresh and warm is best but these still would be good at room temperature. Enjoy! Hi Jen…love your spirit, recipes,But, am unable to print them from computer(so sad)…have tried several times. What to do? Thank you, Christine. Hi Christine, I am sorry you are having trouble printing! You should be able to print by clicking the “print” icon below the small recipe picture. My next suggestion would be to click that same “Print” icon and choose the option to “save to PDF.” After saving, maybe it will print your PDF? Lastly, more time consuming would be to copy and paste the recipe into a word doc and print from there. Hope this helps and I’m sorry I don’t know an easier solution! Can’t wait to try these! Do you think I could freeze some to bake later? Hi Amy! I have never personally tried freezing them, but I do think they would freeze well – just defrost before baking. Enjoy! Would these be okay to prep the day before a party and keep in the refrigerator? I would then pop them in the oven before guests arrive. They sound FANTASTIC! I am excited to try them. Hi Katlyn, it should be okay but you will need to take care to lay them on a flat baking sheet and cover with a damp towel or paper towel while you are making them then remove the towel and immediately cover with parchment paper then cover tightly with plastic wrap so they are airtight -any exposure to air will dry the wrappers out. I hope this helps!